A HOMELESS man has said he was told by housing advisors to quit his job in order to get a place at a hostel. 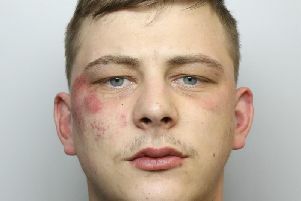 Anthony Rimmington, 25, has been sleeping on floors of the homes of friends and family since losing the flat in Morley he shared with his ex girlfriend. The UK Mail warehouse sorter said he was not able to pay the rent on his own after the couple split up, and was unable to pay for another privately rented flat. Mr Rimmington, who said he had been on the priority housing list since last year, said: “I knew I was going to become homeless so have been going to the housing office at Morley One Stop. “They suggested a hostel, private rent or shared occupancy, asked me some questions about my work, hours and wage and then said I should quit my job so they could get me a place in a hostel. “I think it is disgusting. Without my job I have nothing to look after my kids and there are lots of people out there struggling to get jobs. Mr Rimmington said he looked after his three-year-old son Leon at the weekends and was worried he might lose that if he couldn’t get a place of his own. A spokeswoman for Leeds City Council said: “It is certainly not correct that Mr Rimmington should give up his job in order to get a place in a hostel. We are very sorry if he was advised this. “Mr Rimmington does have a ‘homeless’ priority status but there are many people who have a higher priority status because of their additional needs and vulnerability, such as disability or health issues, or those who have dependent children. “We understand and sympathise with Mr Rimmington’s situation, however he is doing the right thing in bidding for lots of suitable properties, to maximise his chances of finding somewhere soon.